To watch a video; click a title below and it will pop-up in a new tab/window. unseen clips, a look at Takeshi's Castle around the world, & every victory ever! 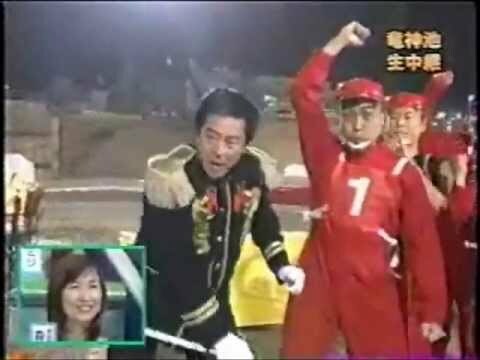 the definitive top ten Takeshi's Castle games. Here we reveal the results! and graphics. Voila! It's our exclusive Remixed A to Z. Just as it should be! A look back at 100 of the most memorable Takeshi's Castle moments ever. Plus special bonus features, all-new Tani, classic Craig & your favourite clips. and slips of all time - all topped off with a generous helping of Craig-ness. aired on TV, anywhere in the world, since its first broadcast on TBS in 1988.
many have you seen? Here are all of them in three minutes. Never seen a winner on Takeshi's Castle? Let's rectify that! Here are all eight Show Down victories together in one video. winners, best losers, and best ball-blasting blows. the outcome, these contestants certainly had Fighting Spirit! failures from the pitch to the Lake, via the waterfall. a princess, but they have all bagged a Fighting Spirit Award. From the sick to the kooks and the downright gnarly... Or something. It's some of the best and the worst Wipe Out attempts ever. Bro. are plenty of ways to fight a Sumo battle, as this lot show. High Rollers - all of which won a Fighting Spirit Award! crossings. An award-winning Skipping Stones collection. than one way to fail, as these award-winners demonstrate! for fans; featuring never-before-seen footage and classic Castle moments. is invited to take part in a Family Special episode (Ep 42). 2003 Challenge advert for Takeshi's Castle. in this American look at international TV, from 1999. We sent Paul one of our old mugs, who gave it to his dog Buster. 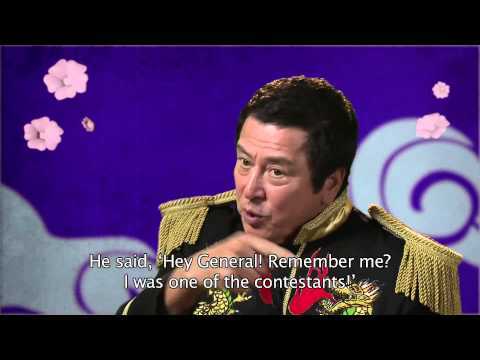 Challenge recorded an exclusive interview with the General himself. filmed footage of General Tani, from March 2013. August 2004 where viewers chose which of two Specials would be aired. /2010 Takeshi's Castle DVD sets. DVD Advert - Short Ver. 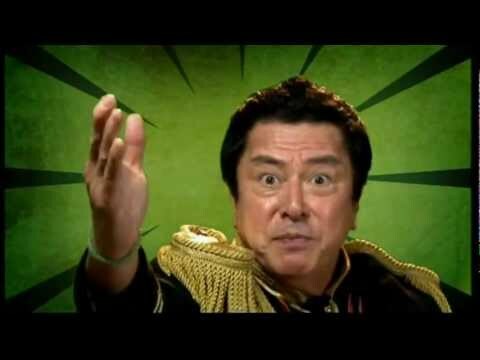 Takeshi's Castle advert, from August 2007.
and new (September 2009 - ) Takeshi's Castle graphics. episodes (2009 - ) and the old series (November 2002 - May 2009). In the words of Tani, "Let's Go!". Music: "LET'S GO Rakuten Eagles" - DEF. DIVA. Our snowy music video from Christmas 2005. Music: "Winter Wonderland" - Bing Crosby. Monsters get mashed by Takeshi's games. Music: "Monster Mash" - Bobby Pickett. The ladies' favourite struts his stuff. It can be Christmas everyday with this video. Music: "I Wish it Could be Christmas Everyday"- Wizzard. Takeshi's tricks are, kind of, magic. Ish. Music: "A Kind of Magic" - Queen. Higashi feels the contestants' pain! Music: "Eye of the Tiger" - Survivor. Couples in love, in trouble, and in the water. Music: "The Time of my Life"- Bill Medley & Jennifer Warnes. Highlights from the 2004 remake. Video by Tom. Music: "MXC Extended Theme"- Bumblefoot. Click a game to listen to its original background music. The player will pop-up in a new window. "Bomberman" from Hudson Game Music. "Leona's Pursuit" from Dominion Tank Police. "Honky-Tonk Piano" from Dominion Tank Police. "Flying Alive" from Taito Game Music. "Sonson" from Capcon Game Music. "Combat! March" by Leonard Rosenman. "Nuts and Milk" from Hudson Game Music. "AJAX Cross Point" from Konami Game Music Vol. 4. "Vibrations" by James Last Band. "Buta-san" from Jaleco Game Music. "Rantou! Ransen! Ranma Panic!" from Ranma 1-2. "O.K. Corral" by Franck Pourcel. "Symphonic March" from Ultraman Symphony. "Thunderbirds Are Go!" by FAB ft. MC Parker. "Wolf of the Battlefield" from Capcom Game Music. "Disco Star Wars" by Meco. 'Track 8' from Ganbare! Kickers. "Hospital Chase" from Star Trek IV: The Voyage Home. "Fantasy Zone" from Sega Game Music Vol. 2. "Raw Power" by John Devereaux and David Reilly. "Voyage to Dreamquest" from Godzilla Legend 2. "Sunshine Drive" from B.B. (Burning Blood). "Moving On" from The Runaway Train. "March of the Elves" from Santa Claus: The Movie. "Taiyoga Kureta Kisetsu" by Blue Triangle. "Combat March" baseball cheer song. "Raiders March" from Raiders of the Lost Ark. "Okunitorida na Moshi Okunidori" from Sengoku Busho Retsuden Bakufu Doji Hissatsuman. "Monja Mura no Soudou" from Mashin Hero Wataru. "Sanchin Okoru" from Prefectural Earth Defense Force. "Prologue~ Super Deadly Drive" from Maris the Chojo. "Power Spots Theme" by Bill Conti. Opening Theme from NEW Hissatsu Shigotonin. "Marine's Hymn" from Full Metal Jacket. "Mysterians March" from Godzilla Legend 2. "Adventures" from Music of Super Mario Bros. 3 CD. "Star Soldier" from Hudson Game Music. "Hashire Koutaro" by Salty Sugar. "Dragon Quest Fight" from Dragon Quest 2. "Athena" from SNK Game Music. "...Not Learnt By Experience" from Dominion Tank Police. "William Tell Overture" by Gioachino Rossini. "Mt Tsukuba Fight Scene" from Far East of Eden: Ziria. "Capcom World" from Final Fight G.S.M. Capcom 3. "Sky Kid" from Namco Video Game Graffiti. "The Chosen One" from The Golden Child. "Escape from Torture" from First Blood Part II. "Odoru Ponpokorin" by B.B. Queens. "Bridge over the River Kwai" Theme. "Dare ga Konna Otoko to Iinazuke" from Ranma 1-2. "Dot Shooter" from Taito Game Music. "Mick Meets New York" from Crocodile Dundee. "Difficult Winding Road" from Bari Bari Densetsu. "Surfing USA, Instrumental" by Beach Boys. "Aquatic" from Music of Super Mario Bros. 3 CD. In the late 80s, Bandai relased two Takeshi's Castle games for the Famicom (NES). These were part of the Family Trainer series in which the games were controlled by stepping on a floor mat. The Takeshi Jou games were only ever relased in Japan, but you can now download both to play for yourself. "Fuuun! Takeshi Jou Two" and NesterJ Emulator. * You will only need to do this the first time you play. We have put together guides on how to play both games. Click a title below and the guide will pop-up in a new window. By sending off the tokens found in each of the 2009/2010 official Takeshi's Castle DVD sets you could claim a free gift box. Included in this box was a board game. Below you can print off an exclusive Keshi Heads version of this game, which has been fully translated into English. The board is split into four sections. Print each quarter onto a sheet of A4 card, or paper, cut around the edges and stick them together. The images all slightly overlap to make them easy to line-up. Two dice are needed to play the game. A regular dice and the Event Dice. Print off the image below, glue it to some card, and cut all the pieces out. Fold and stick the dice together. • All players begin on the "Start" space and take it in turns to roll the dice to determine the number of spaces they can move their counter forwards. • If a player's counter ends up on a space with an instruction written on it, the player must follow the direction (eg. Advance 3, or Miss a Turn). • When a player reaches a "STOP" sign, even if they do not land directly on it, they must stop here despite the number of moves they rolled. Upon their next turn the player has to attempt to clear the space they're stopped on by following the rules of the game. - If they fail, the player must keep attempting to clear the space on each of their following turns until they are successful. - Once the player successfully clears the "STOP" game they can roll the dice and move forward the determined number of spaces. • The first person to reach the "Goal" is the winner.